Baby Art Workshops are a fun and creative way for moms, dads and caregivers to have fun and bond with their babies while they have an amazing sensory experience! During our Baby Art Workshops, babies to get messy with non-toxic vegetable and fruit-based paints, sponges and stamps. Mommies, daddies and caregivers will have fun and help babies create their masterpieces on canvas. The Baby Art Workshops are a chance for babies to create abstract art or cute hand print and foot print canvas art while they explore colour and paint. Babies will have their choice of creating on two 8×10 canvases or a 9×12 canvas. 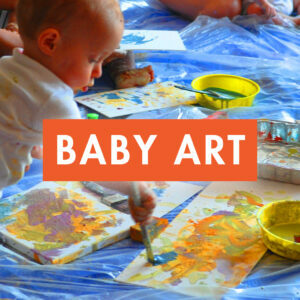 Baby Art Workshops are recommended for babies 6 months to 24 months. The workshops are held at the studio up to two times per month. Check our event calendar for upcoming workshops. Thanks to the Mat Leave Map for listing Fresh Paint Studio on the map! Moms who are looking for fun activities in the city check out the Mat Leave Map.